So I tried to create a physical vision board the other day, but my house is being revamped and redecorated. Currently the kitchen is on it's way to be ripped out and re installed, therefore all the crap is in the dining room. To cut a story short the printer is no where to be seen as everything is everywhere. I still wanted to create a small vision board online, and share with you guys! So here it is above. Some things I want to have/achieve in the next year or so. If you don't know what a vision board is - it's basically a group of images that represent what you want to do or have in life. Creating a vision board is meant to be very good for you as it reminds you what you're goals are and sends them to "the universe". I knew straight away what I wanted to add to my vision board without looking at anyone else's. My first goal isn't something that people would even add to their board but it's a MAJOR goal of mine. I have had some recent anxiety with my teeth and basically really dislike them. At the end of this year or beginning of next year I want to get braces (My jaw is very misaligned) but I can't get a consultation until my second root canal is finished and my dentist is happy for me to go ahead (so it's a waiting game right now). Invisalign is kind of the route I want to go down rather than traditional braces. I have longed for them for years and I am working hard to save money to get them. I have visualized the car I would want if I had a choice with a realistic budget. The Audi Q5 is a nice car and I keep seeing it everywhere. I did like Range Rovers but I think the Audi has a nice spin on that kind of 4x4 stylish car. I also do want enough money in the bank to be comfortable. I could have added being a millionaire but then money doesn't always buy you happiness. Let's just say I don't want to be "greedy". I want to have a really successful blog and have a job that can work alongside it or within the Digital Marketing sector. I really don't know how I'm going to get into that line of work, but something tells me my blog with help me with that. Also... I'm so close to 1K followers ... that's crazy to me, I have dreamed for a long time to reach that goal. So yea that's my current vision board. I know I have left some other important things like health, friends and family. At this point in my life I am happy with who I know are my true friends, my health is almost good apart from anxiety and dental and my family are with me and are healthy. I am grateful for that. Do you have a vision board? 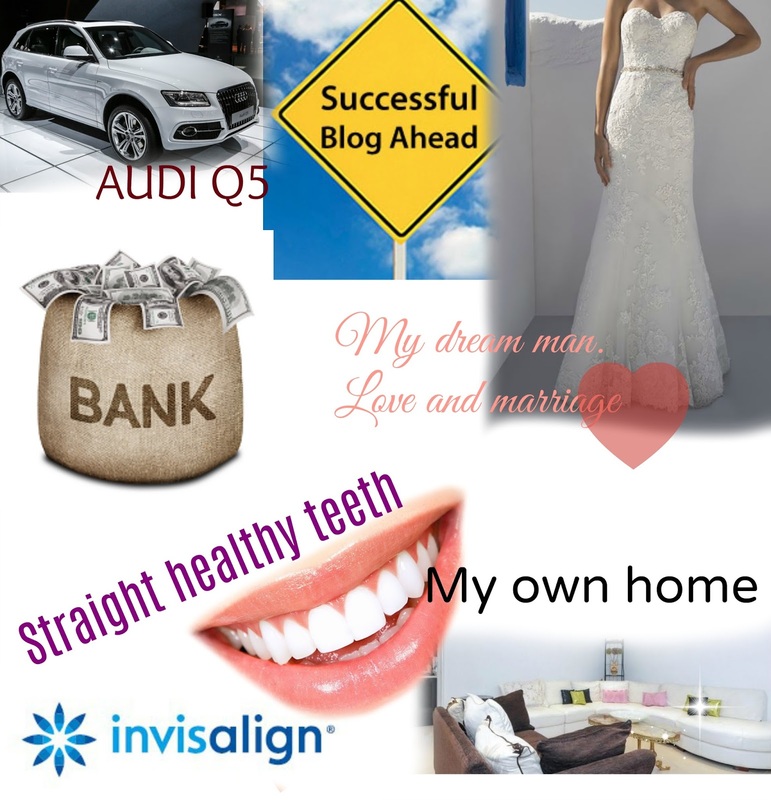 What would be your goals on your vision board? Vision and mood boards are a great way to help you towards your goals. There's been so many success stories from people who use them. I do one each year to help me meet my goals. I hope you get everything on yours! I've never made a vision board but it's a great idea to stay focused. Good luck with your goals! This is such a great idea for a post. This is such an interesting idea to keep you on track towards your goal! I have never done a vision board before but love the idea! Great idea. Your vision board can totally be accomplished. I wish it all comes true for you. I loved this post, I don't actually have a vision board but I do have a list of dreams I made when I was a child/teenager and I've been working on them in adulthood, I'm almost there now and I can't wait to reach the last few things on my list. We did quite a lot of vision boards at school but I've never really thought about creating one now though it's great to have something to visually represent your dreams! I'm with you on the Audi A5 - gorgeous! Really nice post this is really good. Vision boards sound like such a good idea to me. I never have time to do crafty stuff like this anymore, but I wish I did! That's a really cool thing that you've created a Vision Board! I alway like to make lists of everything because I don't have a printer but it's great to visualize your wishes! OHMY that Q5, that would be a dream come true for me. Nowhere in my budget right now haha, I just bought my first car! A successful blog is def. on my vision board as well! I believe in Law of Attraction too. While I can't help my thoughts from wandering into the negative side from time to time, the law of attraction helps me try to go back to the positive side all the time! Ahh these goals are perfect, I think you've covered pretty much everything. I'm not sure what my vision board would have at the moment, but I think it's a really interesting idea and I think I'll definitely give it a go towards the end of university.